A: Yes, all programs we sell are compatible with Windows 10,8, 7, (32 & 64 bit) and all its predecessors. A: Yes. Mac users can run SimuRide by using a Windows emulator. A Windows emulator is an installed software program that allows computers using the Mac Operating System to run Windows-based programs. Q: Where do I find my computer’s hardware information (RAM, Processor, Graphics Card) to make sure they meet with the program’s minimum requirements? A: Your Operating System, RAM, and Processor can be found when you right-click ‘My Computer’ and select ‘Properties’. Your Graphics Card can be found by going to your Start Menu and clicking ‘Control Panel’ > ‘Hardware and Sound’ > and then ‘Device Manager’. In Device Manager, expand the list item ‘Display Adapters’ and take note of the model. Find the minimum requirements for your preferred software version at the bottom of each product page. Q: How do I know if my Graphics Card is up to date? A: Generally speaking, a computer with more than a basic word-processing graphics card should suffice. Different manufacturers label their models on different scales, but you can compare your models online. You can compare graphics cards here by searching the list for your model and clicking on it. Find the minimum requirements for your preferred software version at the bottom of each product page. Other online resources or local computer experts may be able to help you as well. Q: I have a steering wheel already. Will it work with SimuRide? A: SimuRide PRO and SimuRide Trial require the Logitech G29 steering Set. Any other set (with a USB connector) should work with the KeyDef driver, but it may result in only automatic transmission working and the force feedback disabled. SimuRide Home and Commercial Editions work with any PC steering set. Check to see if your wheel set is compatible with PC. Q: Can I install and use the SimuRide simultaneously on two computers? A: Yes, but to be able to do this, you would need to purchase 2 copies of the software. Q: Can I install the SimuRide on a network server? A: No, the software has to be installed directly on the computer that will be used for the simulation. Q: How can I pay for the item I want? Can I order over the phone? A: To make a purchase, browse the online shop for your items. Be sure to click the Canadian residents’ link if you live in Canada for the right currency. Make a purchase by adding your items to your online cart and proceeding to the secure PayPal checkout. You will not need a PayPal account, you can use your credit card. You may also pay be check, sent with an order form. Currently, all orders are processed online, by mail or phone. Q: What do I need if I want a 3-Monitor simulator? A: You will need 3 computer monitors and an external graphics component that splits the image across three screens. We offer the TripleHead2Go. Your computer and monitors should have VGA (a.k.a. Analog) out/input. If your computer & monitors use DVI cables, you will need to request the TripleHead2Go Digital Edition. TripleHead2Go Analog Edition is the standard. Q: How many hours should I practice on the SimuRide before I sit behind a real car’s steering wheel? A: Most people need about seven to 10 hours of simulator practice, but others require more or less time before being ready for the road. Practicing on the SimuRide in between car drives is a significant way to build your skills and gain more confidence without using fuel. Q: Is there any highway driving offered? A: Yes, you can practice driving on a highway. A: The SimuRide HE works with any steering wheel type (with 2 or 3 pedals) that works with the Windows 10, 8, 7, XP and Vista. Some old types of steering wheels with the game port connector are not compatible with the recent Windows OSs; therefore, please check first if your computer recognizes the steering wheel. A: No, any laptop or desktop computer that satisfies the minimum hardware requirements (see specifications) will run the SimuRide HE. A: There is no such comparison; you will always need to practice in-car driving with an experienced driver. However, if you have practiced for seven hours on the SimuRide HE and you can drive without any error message, you have saved a lot of stress and at least the first five hours driving in the real car. 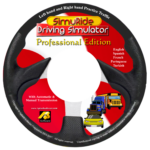 The Professional SimuRide Edition is available to purchase. A: The SimuRide HE is for small vehicles only with automatic transmission. It is made for a home use, for one monitor only and works with any plug & play PC steering wheel. The SimuRide Professional is for trucks, buses and small passenger vehicles with automatic and manual transmissions. Moreover, the user driving a semi-truck with a manual transmission has an option to select an unsynchronized manual transmission that requires double clutching and has to be used with a half clutch. SimuRide Professional can be used with one or three monitors and is intended for driving schools and truck driving schools. The user can select different terrains/scenarios/conditions to focus on. SimuRide Professional is a complex simulator software offering many options. Q: If I purchase the SINGLE monitor Simuride system now, can I upgrade it to the three-monitor system later for an additional $200? A: Yes, but you would have to send us your license key so that we may reprogram it for three monitors. Q: If I decide to purchase the three-monitor set-up NOW, could you reduce the price? A: The Simuride price is not negotiable except multiple units (5 or more). Q: Does the Simuride software work on XBox, Nintendo, or Playstation? A: No. These consoles have different type of processors. To run Simuride, Windows with DirectX (minimum 9.0 version) is required. We will soon offer a version of Simuride that works with lower-end graphics cards, so please check back later. A: Yes. You can print the final report (its most important information & messages). Using versions 2009 and up – Go to Settings/View Report and follow the instruction at the bottom of the page; for 2008 version use the Print Screen option to print. Q: What happens when you miss-shift or do not double clutch correctly? A: The user will get a message and information will be recorded in the Report as a mistake. Mistakes like forgetting to press clutch twice, not accelerating during downshifting, pressing clutch pedal less than 20% or pressing clutch to the floor (except in first or reverse gear) are considered a mistake. A: To keep our simulator affordable we use the popular and readily available Logitech G-29 steering wheel with the six-gear shifter. The idea is to put the student driver on the simulator for his/her first five to 10 hours, instead a real vehicle, to teach basic manual transmission operation using three pedals and H gear shifter. For semi-trucks there is an additional function that requires the student to use the double clutching technique, acceleration during downshifting and ‘half clutch,’ except in first gear and reverse. Using the simulator students can also learn and practice driving a long semi-truck in city traffic, taking wide turns and backing up to a dock. The software can be used with 10 or more gears; however, the customized gear shifter is required. A: You will get 15 different scenarios that can combine with time-of-day and weather conditions to create even more options. Moreover, you can combine each of these options with 25 different vehicle types and settings. A: To avoid unnecessary returns we introduced the SIMURIDE PE Trial-Edition. In the case of malfunctioning software, we offer technical support and replacement, if necessary. For hardware malfunction please contact the manufacturer. A: The SimuRide Professional is presently offered in English, Spanish, French, Portuguese and Turkish. Q: I recently passed my driving test and am looking to learn how to drive a manual transmission. However, not many driving instructors in my area offer lessons. I found a video of your product through YouTube. After browsing your site, I noticed that lessons for a manual transmission are only available through the Simuride PE Edition. Will you be releasing a home edition with a manual transmission feature? 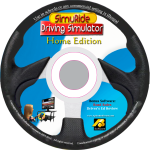 A: We are not planning to release a Home Edition with the manual transmission option, but instead, we offer a SimuRide Professional Edition – Trial Version for individuals who want to learn and practice driving on manual transmissions. Q: What do you mean when you say that the TRIAL version allows for ’50 trials’? Does this mean 50 times switching the program on? Or does it mean 50 times choosing a vehicle? A: 50 trials means; 50 rides. Selecting a different vehicle or a different terrain is considered a new ride/trial. You can drive one vehicle on the same terrain for approximately 45 minutes. Then, you can select another vehicle and/or terrain to drive for another 45 minutes. This way you would have completed 2 trials, and have 48 left. As soon as you end the practice, it is considered one trial. The trial edition is ideal for customers who want to test our simulator before they spend $$$ for the full professional version, or for private users who will likely only need 50 trials. Q: Does your CD include tests similar to those offered in driver exam centers? A: Yes. In addition to the study option the CD includes interactive tests, comparable to official tests where questions are randomly selected from a database that contains hundreds of questions. Q: Does the Road Rules – US & Canada Driving Test replace a driver’s manual? A: While a paper manual is not included with the Road Rules – US & Canada Driving Test, information that is typically covered in a driver’s education manual is covered in the CD. You might also want to check with your state’ or province’ authority for any specific driving rules. A: 2003 version was only available on-line and the password to update it was emailed. All CDs from the end of 2004 contain the UPDATE option; however, it updates only the links to the websites of all 50 States and 13 Provinces/Territories’ official Departments and Ministries of Transportation, Maps, Weather, and Road Conditions. We systematically update our web sites, which will lead you to recent changes in road regulations in your State/Province. Even though most of the Road Rules are valid, we strongly suggest that you use the latest edition of our software. Q: Does your application terminate after certain number of trials or a specific period of time? A: No, it doesn’t terminate at all. Q: Does your ROAD RULES program prepare me for a driving exam? Q: What is your shipping/handling costs for one CD? A: Shipping for Road Rules and CDL Manual is free within the continental US and Canada. Other software has different shipping costs, listed with each item in our online store. Q: Do I have to purchase one ‘US & Canada Driving Test’ CD for California and another for Ontario? A: No. One CD contains rules for all States and Provinces and they are listed for you to select State or Province you are interested in. Q: When ordering, do I have to specify Spanish Language, if I want to practice ‘US & CANADA DRIVING TEST’ in Spanish? A: No. Road Rules – US & CANADA DRIVING TEST CD is offered in 10 languages (English , French , Spanish , Polish, Russian , Arabic, Chinese (2 versions) , Japanese and German). A: Yes. The road and safety rules are almost identical in all States and Provinces. Truck/Bus drivers relocate across the whole of the North American Continent; therefore, the rules must be similar. Air brakes functionality, hazardous material handling, or pre trip inspection cannot be different. This software is good for all states & provinces. 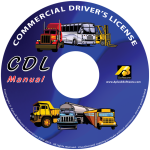 Q: Does the Commercial Driver’s License Manual CD contain air brake and pre trip inspection? A: Yes. The CD includes all endorsements: air brakes, passenger/buses, combination vehicle, doubles, triples, hazardous material, tank vehicle, and pre trip vehicle inspection. Different states and provinces list driver’s license dorsements differently (word, letters, or numbers), the main idea is the same. A: No. In most cases, studying our CD is enough to successfully pass a test. However, we strongly recommend taking classes with an instructor, who will not only teach you the rules but also gives you additional information that is helpful for you on the road. Our software alone doesn’t make you an excellent trucker, it teaches you necessary rules and skills to pass required exams to obtain a Commercial Driver’s License. Q: Is this Driver’s Educational product an interactive CD ROM? A: Yes. Instead of reading a paragraphs, students simply read the material in a question and answer format . This way the user gets specific information related to subject matter tested on actual exams. This software works more like a Computer Based Test (CBT) and is easy to navigate. Q: How would I know which mistakes I made on my test? Your software only gives the final result? A: The software has been designed in two modes: STUDY and TEST. The test is designed exclusively for testing yourself on the knowledge of road rules. It is during the study mode that you can actually check the questions you made mistakes on. Hint for CDL users: There is a counter on the bottom left of the screen of the exam mode that increases should your answer be correct, or stays the same. Do not confuse this with the question counter at the upper right corner. Q: Does the ROAD RULES CD have audio? Does it read the questions to the student if thay do not speak English? A: There is some audio implemented in the current edition of this program, but it does not support the full audio elements. The 2007 version was designed help people with reading limitations offering simple questions & answers in the form of short sentences. The next version of this interactive CD will be launched in 2008 and will include an audio feature where the questions & answers would be read for the user. Q: I have been driving for a long time. Why should I study Road Rules – US & Canada Driving Test now? A: This software works more like a driver improvement program, renewing your driving skills for today’s traffic. Even if you have a perfect driving record, it may be time to review your driving skills. With aging, changes occur in your memory and traffic laws may be modified. You can learn to adjust your skills to compensate for those changes. A: We accept returns of software products that have not been opened and with seals intact and a return shipping and restocking fee will be charged. Therefore, please watch the SimuRide video presentation and read the description of the product carefully to ensure you have ordered the right product. All our products are extensively tested before we ship them to the user. We offer first level technical support by email. If further assistance is necessary, please provide your phone number and we will call you. Returns accepted if received within14 days from the date the item was received. We do not accept returns for customized products.